Excerpted from A Sense of Place, a book by Bellangelo winemaker, Christopher Missick. Terroir is a controversial notion, particularly when talking about wines made in the United States. Terroir is the French term that winemakers, wine grape growers, and wine lovers alike have used for hundreds of years to describe “a sense of place,” and the unique qualities of that place that impact viticulture (grape growing) and enology (winemaking). Encompassing the notion of “a sense of place,” is the idea that geology, topography, climate, geography, soils, winemaking techniques, and even the choice of which grapes to grow, all come together to proudly proclaim, in a unifying voice, or taste if you will, a wine’s sense of belonging to a specific location. For those who accept that there is such a thing as terroir, some argue that the United States has not been producing wine long enough to properly understand terroir, and such criticisms do have a strong point to make. There are no wineries in the United States that can boast a wine library that extends back to the mid-1700’s, where generation after generation of winemaker has crafted distinct wines from the same vineyard locations. To dismiss terroir in the United States, though, is to dismiss the fundamentally unique nature of the various wine regions throughout our country... particularly, the Finger Lakes. In this place, the land is scarred by the receding glaciers of millennia past, and exceedingly deep fresh water lakes fill the carved earth. The climate is warm in the summer and sometimes bitterly cold in the winter. Immense shale and limestone formations sit beneath the surface and impact the flavors in our wines. Each of these pieces of the puzzle of terroir, and more, are encompassed in the notion of terroir, and each of these work together to help foment a distinctly local flavor that embodies a specific site’s unique characteristics. Clearly, there is something unique about our region and, even though its full viticultural potential has only recently begun to bloom on a large scale, people have known for centuries that there is something special here with regard to agriculture and particularly, to grapes. Eleven long, narrow lakes, with equally impressive and fertile narrow parallel valleys, make up what we know as the Finger Lakes today. Originating as ancient rivers and river valleys, each of the lakes has a northerly flow into Lake Ontario.8 Beginning around two million years ago, during what is known as the “Ice Age,” Pleistocene glaciation began, wherein the first of several advancements of massive continental glaciers was initiated.9 Throughout the Ice Age, the extraordinarily vast Laurentide ice sheet, more than two miles thick at many points,10 cyclically advanced southward and retreated northward, carving the rivers and river valleys ever deeper on their southern advancement, and depositing the glacial debris on their northward retreats.11 Eventually, the rivers that flowed north to the pre-cursor of the Great Lakes became sealed, and are known today as the Finger Lakes. Before grapes were cultivated in the Finger Lakes, the Native American tribes had found the land to be fertile and to provide bountiful crops.14 The earliest European settlers recognized the moderating effect that the deep lakes had on the temperatures, and knew this would aid in even more wonderful agricultural prospects.15 It was as if nearly 500 million years of geology and climate fluctuations conspired to craft one of America’s greatest, most unique grape growing regions. 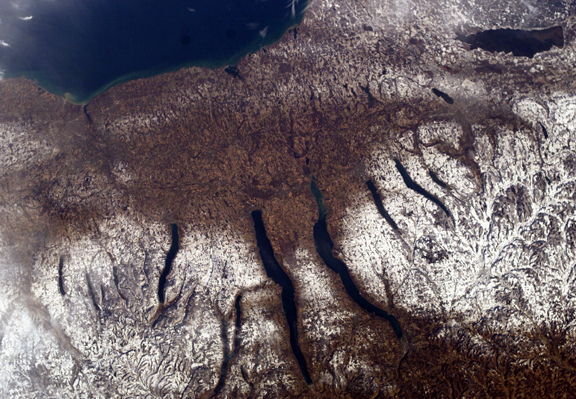 To a very large degree, the unique terroir in the Finger Lakes emanates from the interplay between the ancient soils and rocks and other items of geological significance in the region, and the moderating effects that such deep bodies of water provide. By exploring the nuances of their “Lake Dana” site, Fox Run Winery pays tribute to the terroir with a unique approach called the Geology Series - a small-run, finely-crafted line-up of wines that aids wine enthusiasts’ search for what Finger Lakes terroir is all about. Likewise, Anthony Road Winery produces delicious blends they call Devonian White and Devonian Red, wines with a nod to that geological chapter that shaped the Finger Lakes in so many ways. Discussions of terroir, and specifically soils, are important when discussing Riesling. Historically, the slate and shale soils of Germany are considered among the best locations for Riesling. Additionally, loam soils are excellent foundations for Riesling. Throughout the Finger Lakes, we are rich in shale and loamy soils. These soils help promote minerality in RIesling wines, a quality that, when combined with delectable fruit and firm acids, contributes to crafting some of the world’s best wines. The American wine palate is always in search of a new experience and, with decades of practicing our art with vinifera varietals under our belts in the Finger Lakes, the American desire to explore a new wine frontier will once again turn to the east, where dynamic, rich, mineral-based soils, impacted by millions of years of geological transformations, combine with cool-climate growing conditions. The great irony is that one of the great new frontiers for grape cultivation and winemaking in the United States was once one of its old frontiers. For, just as the European wine lover’s palate has evolved over centuries to recognize that great wine comes from a variety of regions with varying soils and climates, so shall the American wine lover recognize, in short order, that America has its own specialty wine regions. A crisp, pleasingly acidic, food-friendly Riesling, such as one you will find in the Finger Lakes, one that truly expresses terroir, is something unique to our region. When tasting these wines, there is a “sense of place” that will envelope you. A world of wine wonder awaits all those who seek to discover our region, and we are thrilled to be a part of this exploration with you. We are committed to our promising of delivering authentic "Finely Crafted Finger Lakes Wines." 1 See Paleontological Research Institution, New York State Geography, http://www.priweb.org/ed/finger_lakes/nystate_geo1.html (last accessed Dec. 28, 2012). 2 See Paleontological Research Institution, New York State Geography, http://priweb.org/ed/finger_lakes/nystate_geo2.html (last accessed Dec. 28, 2012). 4 See I Love the Finger Lakes, Salt Mines and Brine Wells of the Finger Lakes, http://www.ilovethefingerlakes.com/basics/geology-saltmines.htm (last accessed Dec. 30, 2012). 5 See Paleontological Research Institution, New York State Geography, http://priweb.org/ed/finger_lakes/nystate_geo2.html (last accessed Dec. 28, 2012). 9 See Paleontological Research Institution, New York State Geography, http://priweb.org/ed/finger_lakes/nystate_geo3.html (last accessed Dec. 28, 2012). 10 Fulton, Robert J. and Prest, Victor K., Introduction: The Laurentide Ice Sheet and its Significance”. Géographie physique et Quaternaire, vol. XLI1 n° 2, p. 181-186, 3 fig. (1987). http://www.erudit.org/revue/gpq/1987/v41/n2/032676ar.pdf (last accessed Dec. 27, 2012). 11See Paleontological Research Institution, New York State Geography, http://priweb.org/ed/finger_lakes/nystate_geo3.html (last accessed Dec. 28, 2012). 12 Fulton, Robert J. and Prest, Victor K., Introduction: The Laurentide Ice Sheet and its Significance”. Géographie physique et Quaternaire, vol. XLI1 n° 2, p. 181-186, 3 fig. (1987). http://www.erudit.org/revue/gpq/1987/v41/n2/032676ar.pdf (last accessed Dec. 27, 2012). 13 See Paleontological Research Institution, New York State Geography, http://priweb.org/ed/finger_lakes/nystate_geo3.html (last accessed Dec. 28, 2012).